Why is McDonald’s Called McDonald’s? Though prominently portrayed by Michael Keaton in “The Founder,” Ray Kroc is not actually the founder of McDonald’s. In fact, he began as a franchisee. Brothers Richard and Maurice McDonald began what would become the McDonald’s we know today in 1948, in sunny California. The two men wanted their restaurant to stand out from the rest, and in a time when speedy service meant big business, the Golden Arches soon made their everlasting mark. Why is it called McDonald’s? The surname of the two founding brothers stood for the hamburger giant even after Ray Kroc bought the company from them in 1961. His company, McDonald’s System, Inc., cost him $2.7 million. No other names have been considered since, much like the Golden Arches logo has stayed almost the same, no matter where you go. As part of their business plan, the McDonald brothers wanted to create a lasting image in their customers’ minds. 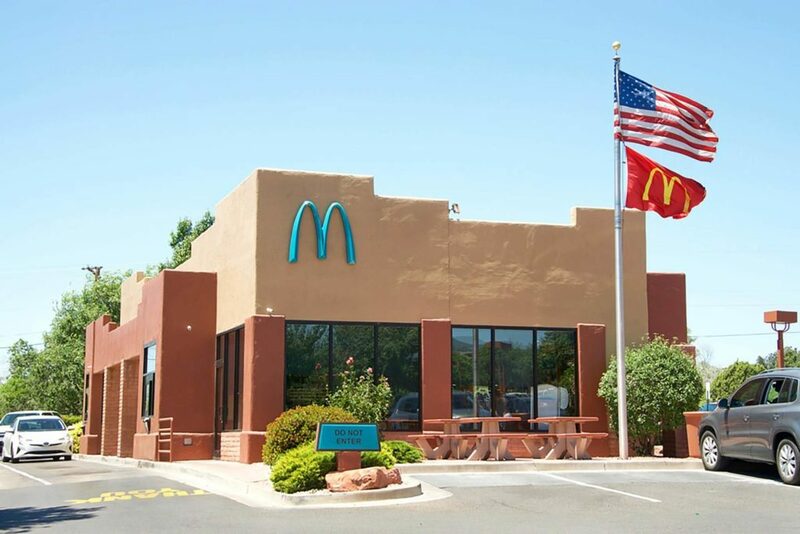 Knowing a red-and-white color scheme would attract business, the McDonalds commissioned an architect to create the iconic Golden Arches we are familiar with today. The neon yellow was to stand out amongst the scenery and pinpoint customers to their favorite hamburger stand. It has been said that Ray Kroc wanted to get rid of the Golden Arches, but Louis Cheskin, a design consultant, convinced Kroc otherwise. Citing the shape of the arches, which “resembled female breasts when observed from afar,” Cheskin believed Freud’s psychological influences were at play. To get rid of the arches would mean denying customers a subconscious desire. Kroc, for his part, believed Cheskin enough to leave the arches alone, and so they still stand today. However, the Golden Arches aren’t yellow at every location. In fact, Arizona has turquoise arches to better fit with the natural surroundings, and California has black arches. You’ll also see white arches if you visit a McDonald’s in Paris. SEE ALSO: Why is Burger King Called Burger King? McDonald’s has endured quite the criticism during its long history, even before such movies as “The Founder.” In fact, “Super Size Me” is cited as having changed the minds of many Americans concerning how healthy fast food really is and it seems not a year goes by without the Big Mac-Daddy somehow involved in another lawsuit. However, McDonald’s does have some interesting history that shows another side of the fast-food giant. For example, the Big Mac was added to the national menu in 1968. It was an item conceived of by Jim Delligatti, who owned a McDonald’s and brought his idea to the big-wigs of the hamburger world. Many franchisees have brought their menu item ideas forward and a handful of them have been successful in making it onto the board you see at any McDonald’s location. McDonald’s franchisees receive training from a place called Hamburger University, where they are instructed in the McDonald’s way and awarded a diploma after graduation. More than 275,000 people have graduated from this university, which began back in 1961. Another interesting fact about McDonald’s is that their fries were originally not served with ketchup. They were meant to be eaten plain. However, customers began to ask for small amounts of ketchup, so the employees would stock “Dunk Kups” each morning to be handed out as customers arrived. While McDonald’s charged for them at first, they then began handing these Dunk Kups out freely. McDonald’s is certainly a well-known entity among many generations, past and present. Whether you amused yourself in the Play Places as a kid, worked the counter for some extra cash, or visit the nearest location of this fast-food legend often, it’s hard to go through life without encountering a McDonald’s. If you could suggest one new menu item, what would it be? Comment below!